It's not so much the destination that matters but, rather the journey and who you meet along the way. At 96 years old my Grandma was a spunky, tough little nut. She wore her silver hair in plaits on each side of her head and loved to play with porcelain dolls. She had a smile that lit up a room and was sweet as an angel, so long as she got the candy that the nurses at her home would sneak in for her. She was a woman filled with the spirit and said she was planning to live to see Jesus come again. At the time I know she meant in the flesh but on Tuesday we found that she had to settle for the Spirit. She finally got tired, her mortal body could take no more and she gave in to the the peaceful rest that comes from living a good life, loving well and being loved and knowing her next vision was to be of her savior. Rest well Grandma. I know that this isn't good-by, just see you soon. Grandma's 96th birthday, May 2007. 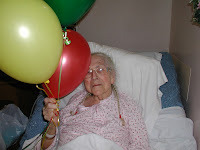 Edna J. Evers, 96, passed away Tuesday, March 4, 2008 at Chico Care Center. Edna was born on May 19, 1911 in Hamilton City to Albert and Tisha Gilmore. She graduated from Chico High School in 1929 and married Henry K. "Hank" Evers in Reno, NV on September 9, 1929. They resided in Stockton until 1942 when they returned to the Evers family ranch in Butte Creek Canyon. She stayed at the ranch until 1981 when her husband died and she then moved to Casa de Flores mobile home park in Chico. Edna is also preceded in death by her first son, Henry "Hank" Evers and her sister, Margaret Grater of Red Bluff. Edna is survived by her daughter, Kathleen (Denis) Beach of Green Spring, WV; son, Patrick (Janice) Evers of Pleasanton; daughter-in-law, Marilyn Evers of Chico; grandchildren, Denise Wenner of Harpers Ferry, WV, Troy Beach of Magalia, Karen Flatten of Greenville, SC, Julie Hagey of Penn Valley, Susan Evers McCauley and David Evers both of Chico and 19 great- grandchildren. Edna's greatest love in life were her family, animals and her flowers. She always managed to find time to care for her very large garden of flowers, irises and roses being her favorite. She also loved needle work and did very fine embroidery, quilting and crocheting. In later years when she was not able to work with fine thread, she used yarn to crochet tops on towels to hang in the kitchen. At age 94, she was still producing eight towels daily. Her family and friends have distributed these towels country wide. Edna will always be loved and missed by those she left behind. Sometimes the smallest things have have the greatest impact on your life. 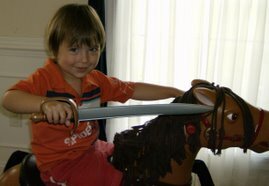 My li'l bother (nope, not a typo) was telling his co-worker about is sister and her 7 kids, 4 cats, 3 dogs, 2 chinchillas and 2 horses. The co-worker asked if it was a religious thing or if I was just crazy. My brother assured him it was the latter!